I guess it depends on what you are listening to the songs on. For me, I spend most of the time listening to things in the car, or via my iPhone headphones. I don’t notice much difference in quality. I seldom pump stuff through my studio speakers. I do have my stereo hooked into an Airport Express and music through that sounds good I think. I think most of my stuff if around 160bit AAC, unless there is a particular album I really like, then it’s probably higher. When you start ripping stuff, and start getting a huge collection, you ought to think about getting some sort of protection for it. About 10 years ago, when I first got an iPod, I started ripping all my CDs to iTunes. I quickly got to 100gigs, and it was growing fast. But….what would happen if that hard drive died? I’d lose months if not years of work. I decided to build a cheap server box using parts I had, and created a RAID5 setup where you take 3 or more drives, and spread the stuff out across them, and if ONE of the drives were to fail, then you can have the other two recreate it. I had to do this once in 3 years of having that machine run. I then switched to a NAS, which is basically the same thing as building a computer, but it’s smaller, more quiet (nearly silent), and just better and so many ways. That lasted until March, and it had 2 drives die on it over the years (I think in 5 or 6 years). Never lost a track. Took the bad drive out, put in a new one…….wait about a day for it to rebuild. Done. My current setup is one based on a Synology NAS. Basically, then have a line of NAS products that run this awesome software. I got a 5 bay unit (I also WON a 2 drive unit recent for beta testing software for them), and moved my stuff to that. They have these iOS/Android apps that you can STREAM your music from anywhere to your Phone. Or Stream video. Awesome. And the stuff is still safely on a RAID5. 10+ years of collecting. Whatever you rip into, you have to think about the security of it. At least get another drive to clone the one you have. Drives are cheap. 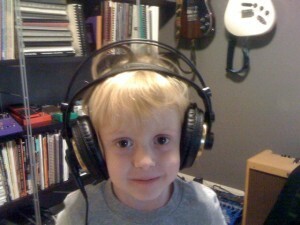 I have Sennheiser HD 280 PRO’s which are insanely high-quality for the price. I do have a small collection of .flac and .alac but much like you, it’s mostly only the most subtle and finest details I notice. Volume seems to be increased and depending on the production, tracks could take on a much warmer or a much colder and more hollow pseudo-reverb. For the most part though, what I find is that a lot of sounds are more easily separated and very minute details can be heard, but overall, I feel as though they only add a little more character, rather than revolutionize a way to hear a track. Unfortunately, I only have a 1 terra HD and I have done nothing to back it up. I know one day I will regret my laziness and lose years of music but I’m not worried right now. Lazy…..you need to back up your stuff. There is no excuse when you can go get 2 Terabyte hard drives for about $100 or less. This is my very next investment. I’m planning on a terabyte drive to dual as a backup and a portable for my laptop. It’ll be getting low use. I trust the WDs…any opinion Eric on brand & model? I also use a Time Capsule wifi backup system. Normally when you convert into low quality, its will lose few instrument clearance. But from low quality , you can not convert to high. Little low quality is easy to archive and save space. Without headphone you can not hear the difference. So don’t worry. Try the jriver Media Center. It’s what most of the people at CES use.